What do you get when you cross a veteran British car designer with two ace British automotive mechanics, race enthusiasts all? In a very good year, you get the spark of an idea that becomes a high quality, high-performance British sports car, one of the best ever built. The HRG (or "HURG" to its fans) was a lightweight, moderately priced, no-frills sports car manufactured from 1936-1956 (with a gap for the War years). While it wasn't big on comfort, it looked faster than it was, and it hugged the corners and was nimble on the track. Only 241 of these hand-built beauties were ever made, and any owner lucky enough to drive one knows what it means to drive a legend. In 1935, Henry Ronald ("Ron") Godfrey, a car designer, approached Major Edward ("Ted") Halford, an automotive mechanic, about developing a new sports car. The two had raced together at Brooklands, one of the earliest, purpose-built, banked race tracks anywhere. Godfrey already had extensive experience in building cars. In 1905, he and Archibald ("Archie") Frazer-Nash met at technical college, five years later forming GN to manufacture cyclecars. By 1911, they'd sold their first two-cylinder car. When Frazer-Nash left the business in the mid-twenties to start Frazer-Nash, Godfrey left, too, establishing a business to repair and rebuild GNs. In that enterprise he met and partnered with Stuart Proctor, the two producing their own Godfrey and Proctor car. Unfortunately, the car did not prove successful and production ended in 1928. The following year found Godfrey partnering again with Frazer-Nash in Nash & Thompson, an enterprise that made hydraulic gun turrets and radar systems for planes. Halford was no stranger to the automotive world, either. A WWI pilot, race car driver, and engineer, he had been the senior mechanic on the Vale Special, a sports car made between 1932 and 1935. 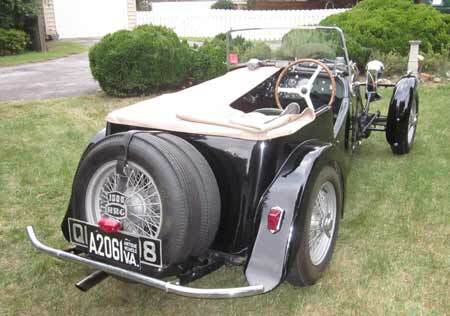 The earliest of those cars were handmade and largely utilized Triumph parts. They handled easily but topped out at 83 mph, not nearly fast enough to win many races. Larger engines were eventually added to the lightweight, open sports cars. So, that's the "H" and "G" of HRG. What about the middle "R"? Once Halford and Godfrey began working together, they were able to bring Guy Robins, another Brooklands racer, on board as the third partner. His automotive experience had been with Trojan. First built by Leyland Motors, the early Trojan was a moderately-priced, easy-to-care-for car with a chain drive and solid rubber tires. In 1928, however, Trojan Ltd. began making it with an updated body, adding balloon tires. The revised version was a little more expensive and ran a bit faster. Just as in the States in the thirties, popular demand for cars kept growing, and manufacturers concentrated on meeting that need. Mostly they built family cars, no one focusing much on the more limited sports car market. With the exception of some super-expensive models, what sports editions there were tended to have the family car chassis with a sportier body and louder exhaust. That combination, with its poor overall performance and lackluster handling, wasn't what sports car drivers had in mind. HRG set out to change all that and develop a "gentleman's racer," one suitable for day-to-day driving that also had the characteristics needed to compete in races or hill climbs. With an eye towards performance and handling, its founders rented a workshop at Kingston-on-Thames and set about developing working drawings, followed by a prototype. They wanted to keep the car lightweight with a low center of gravity and precise handling. 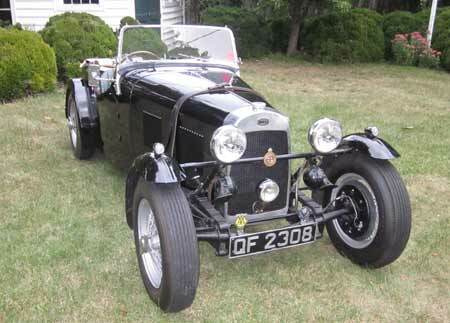 In six months they had their first prototype, utilizing a Meadows 4 ED overhead valve engine (4-cylinder, 11/2 Litre, 1497 cc, 12 hp, its acceleration rate 0-50 mph in 9.8 seconds), a Moss 4-speed gearbox, and a Marles-Weller steering box. The ash-framed, aluminum clad two-seater body was set off with 17-inch wire wheels, and the overall weight was 1570 pounds. Other hallmarks of its styling included a long hood, cycle-type front fenders, a vertical radiator, and exposed front quarter-elliptic leaf springs. The 1500 2-seater, no-frills prototype was a success, holding up well even when testers and members of the automotive press were asked to push it to its limits. The next step was moving into small-scale manufacture, forming a company in February 1936 and renting a larger production space in Tolworth, Surrey, just south of London. A prototype was ready in the spring of 1936, and five cars were produced that first year. Eleven cars were built the year following. On September 4, 1937, Bill Boddy, editor of Motor Sport, drove an HRG at the Lewes Speed Trials and came in third in the novice class. The car was definitely getting attention. 1938 was a good year for the marque, as well. For one thing, the first 1100 cc model was made, with an overhead cam Singer 9-hp engine. And for another, the HRG was the highest-ranked British car at the 24-hour Le Mans race. That was also the year that the only HRG coupe ever made came out of the HRG shop. It was Halford's idea, and it had a Triumph engine and a frame made from a widened two-seater race car, the Halford-Cross Rotary Special. Once Halford left HRG, though, the remaining partners decided not to continue with the coupe. Total production of all types of HRG that year was nine. In 1965, an American bought the disassembled remains of the coupe for the equivalent of about $20, and in 1983 brought the car to the U.S. After long-term restoration by Hahn and Woodward in Harmony, Pennsylvania, the car debuted at the 2010 Pittsburgh Vintage Grand Prix and was shown again at the 2011 Amelia Island Concours d'Elegance. There it was awarded the Road and Track Editors' Choice Award for the car the editors would most like to drive. The last year of pre-War production was 1939; eight cars were manufactured that year, seven of them the new 1100 series. HRG had made the decision in the summer of 1939 to begin making its 1500 series with a Singer engine, as well. The modified engine produced about the same power but ran quieter and smoother than the Meadows engine. In September, however, war broke out and the factory began to be used for war work. Largely involved with high-tech manufacturing, the company produced airplane parts, gun sights, etc. until the war ended in the latter part of 1945. In 1946, the HRGs were once more in production. That was thanks to additional capital infusion from Lord Selsdon and Mr. T.A.S.O. Mathieson. Lord Selsdon (Peter Mitchell-Thomas) was a race car enthusiast who, along with co-driver Luigi Chenetti, would go on to win the 1949 24-hour Le Mans race. TASO (Thomas Alastair Sutherland Ogilvy) Mathieson had begun racing at Brooklands in 1930, drove at Le Mans in 1938 and 1939, and continued racing throughout the fifties. Along the way he also amassed an exceptional group of racing photographs. Recognizing that the HRGs were looking more than a little dated, the company offered customers another option. Their stark styling missed out altogether on the aerodynamic curves of the late thirties models such as the Lincoln Zephyr, Terraplane, and Cord 810/812. To answer that concern, at least in part, HRG designed and introduced a full-width 1500 Aerodynamic 12 hp model in 1947. Customers could choose the traditional or aero body styles-but only thirty of the aeros were built over five years' time. The envelope body (rather than separate fenders, the bodywork enclosed the entire length and width of the car) was not a success. Its radiator was repositioned but otherwise it kept the traditional chassis configuration. There were quite a few fit and stress problems with it as the car's stiff suspension fought against its flexible chassis. In 1948, the style was discontinued. Lord Selsdon was looking ahead when he approached Aston Martin and Allard in 1946 and 1947 about joining together to distribute British sports car in America. In the end, however, they could not reach agreement. By the late forties, Viennese-born Max Hoffman had sole U.S. importation rights to the HRG. His Hoffman Motor Car Co. had a Park Avenue showroom, and he imported at least three HRG aeros. In 1951, however, Jack Wherry was named the sole agent to represent HRG in America. Wherry was a hotel owner in Maquoteka, Iowa who also owned International Motors and was himself a sports car racer. The last cars HRG produced in 1953 were WS-series cars with a short-stroke Singer engine, hypoid axle, and hydraulic brakes; Wherry had all twelve of them exported to the U.S.
Interest in the car was fueled as the HRG continued to win races, in 1948 taking the 24-hour Spa race and in 1949 again winning the 1.5 litre class at Le Mans. In 1950, Guy Robins left the firm and S. R. Proctor joined it as technical director. That year production numbers had declined to only 11 cars produced. By 1952, that number had fallen to six, and to four in 1954. It was time for the company to admit the car needed an overhaul. It was about 1952 when the company began sketching out new ideas, culminating in a final design in 1956 for the MK II project, from which four prototypes would be made. The new cars were to have many more modern features: a double overhead camshaft engine (Twin Cam); alloy wheels; all-independent suspension; a tubular frame and full-width body; hydraulic disc brakes; and cast magnesium wheels. The prototypes looked good and performed admirably — but there was a snag. The HRG continued to rely on a Singer engine but in 1956 Singer was taken over by the Rootes Group which ended production of the Singer engines. HRG might have continued with another engine but that would have meant a new design and prototype. Instead, company officials decided to stop production and focus instead on general engineering and development for other marques, including Volvo. HRG continued to service its own cars, and customers could still send their cars in for rebuilds if necessary. Throughout the 1960s, Miss Grace Leather managed production, despite significant work pressures and poor health. She was said to know every HRG part number as well as the history of all the HRG cars ever built. Lord Selsdon died in 1964, and though a final prototype HRG was produced in 1966, it was difficult for such a small firm to continue. While still profitable, business had dwindled and the company chose to close up shop, doing so in July 1966. Although HRG made only 241 cars, it is thought that 225 survive. That's an unheard of 94% survival rate. (Of that number, about 25 are in the U.S.) Most of these cars are still in use, and some continue to compete. For so many owners still to cherish their cars, HRG must have done many things right. While the cars are not big on styling and are often called primitive or Spartan, they never pretended to be anything but what they were. i.e., rough-riding, easy-handling sports cars. The HRGs were handmade and could be custom-built for an owner's preference as to interiors, wheel size, fender shape, etc. No two cars were exactly the same, but with the exception of the in-house-designed aerodynamic model, they were squared off with straight lines. There were cutaway doors so a driver had room for his elbow and many HRGs had a leather hood strap, that feature alone winning hearts this side of the Atlantic. There was a minimalist approach to comfort — extremely tight, unadorned interiors; little weather protection; no heater; and minimal suspension so a driver felt every bump in the road. There were two basic seats and little more than a plank behind them where a third passenger might sit — if he were masochistic enough to try. But the car accelerated quickly, handled beautifully, and was well-engineered. The windshield, soft top, and side curtains could be set up quickly. The body could be taken off the chassis by loosening just six bolts — and that took only thirty minutes. Once the body was off, it was easy to access every part of the car. That said, however, it was still pre-war engineering and some models still had mechanical brakes. The Singer engines tended to wear out quickly. Fortunately for current owners, however, the HRG Association now owns the HRG drawings and spare parts remaining when the factory closed. When all is said and done, though, perhaps the greatest appeal of the HRG is in the few examples ever built. Owners know one another, share maintenance tips freely, and happily share their knowledge of the HRG with outsiders. They also know there'll never be another built. Although no one has ever replaced the in-depth knowledge of the matchless Miss Leather, the close-knit group of owners do pretty well keeping each other "in the know". To own and drive an HRG is a rare — and historical — privilege.